What if you could increase the millennial audience your video ads reach by 42%? Multiply engagement by 10X? How about boosting views of past videos by 500%? And what if you could do it all by rethinking YouTube’s role in your media plan? Check out our latest research to find out how. Cord cutters are so last year. These days, it's all about "cord nevers." A recent study suggests 18% of the total population has never signed up for cable. By 2025—just a decade from now—Forrester predicts half of U.S. viewers under 32 will not subscribe to a pay TV service. Advertisers are facing a new normal; viewers today are watching as much video online as they're watching on television.1 As time in front of the TV declined last year, 18-49 year-olds' time on YouTube jumped 44% according to Nielsen's Google-commissioned analysis, primarily due to mobile viewership. Source: Includes Nielsen data for 2,984 TV campaigns in 2015. 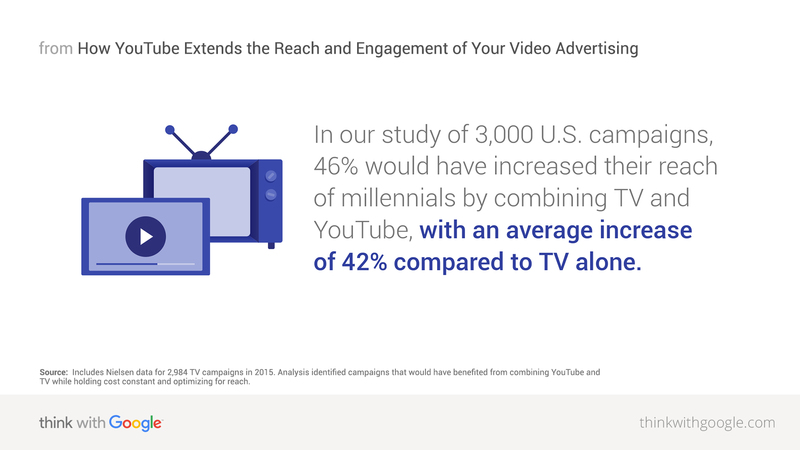 Analysis identified campaigns that would have benefited from combining YouTube and TV while holding cost constant and optimizing for reach. To maximize the reach and effectiveness of your campaign, combine the new tube with the old. Test the YouTube/TV combo to see if it works for your brand. If the best way to reach your biggest audience is, in fact, both ways, revisit media allocations in 2016 and consider shifting some of the reach and awareness dollars currently allocated to television to YouTube. We all know a good video ad leaves you wanting more. TrueView ads—YouTube's skippable-ad format—give viewers a chance to act on their desires. And act they do. We looked at the results for 89 U.S. brands that ran Brand Lift studies and found that viewers who completed TrueView ads—watched to completion or at least 30 seconds—were 23X more likely to visit or subscribe to a brand channel, watch more by that brand, or share the brand video.4 Even viewers who were merely exposed to TrueView ads were 10X more likely to take one of those actions. Source: Google August 2015 Meta-Analysis: Measuring TrueView impact on brand channel engagement. Get the most out of these engaged views by giving viewers something to engage with. Check your brand's YouTube channel: are you happy with what you're offering them? If not, use the CCC method for content creation to populate your YouTube channel with videos that will keep an engaged viewer entertained. Make sure the content cadence you recommend meets viewers in each of the video micro-moments they experience with your brand, whether they're using YouTube to watch what they're into, to learn, to do, or to buy. Most video ads are fleeting. Online, in-feed, or on TV, they run for 15 or 30 seconds and they're gone. But YouTube is different. There, four of the top 10 trending videos last year were ads. Branded videos on YouTube have a long shelf-life, earning views for months, if not years. 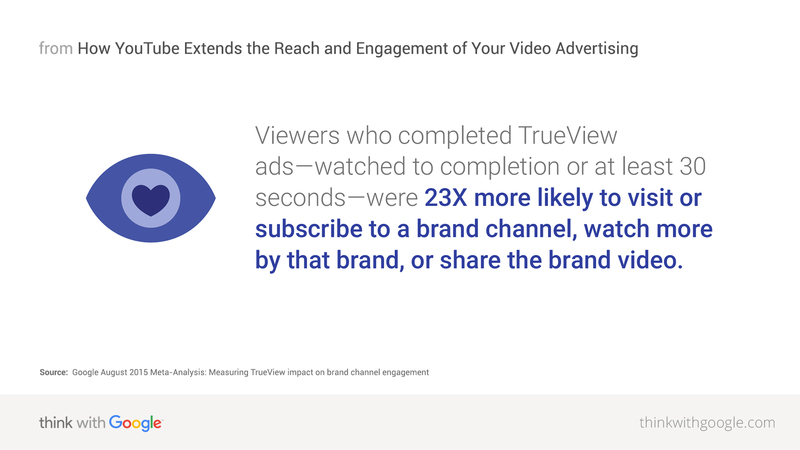 TrueView ads on YouTube are a great way to not only promote new video, but to drive viewership of your brand's past videos, increasing engagement with your brand overall. Research done by Visible Measures shows that each new video brands promote using TrueView actually drives interest in past content, increasing the ROI of previous investments in video. Visible Measures dubs this the ripple effect. 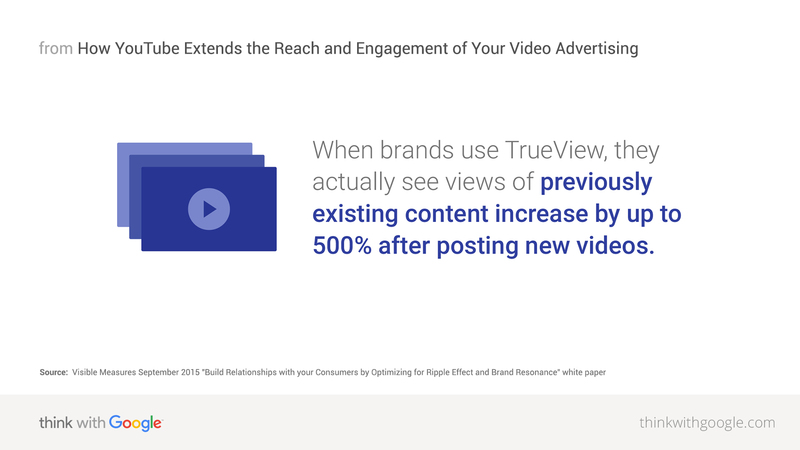 When brands use TrueView, they actually see views of previously existing content increase by up to 500% after posting new videos. Source: Visible Measures September 2015 "Build Relationships with Your Consumers by Optimizing for Ripple Effect and Brand Resonance" white paper. As Visible Measures CEO Brian Shin put it, "the ripple effect highlights the importance of developing an easily accessible video library and continually promoting new content to engage consumers. Our research shows that YouTube has developed a platform that facilitates both an accessible video library and effective promotion." If you're planning to create multiple videos for a campaign, develop a content calendar that'll guarantee a steady rollout. A "distribution drumbeat" will keep people coming back to all of the videos you've worked so hard to create. By unlocking the full potential of your YouTube advertising, you're not just getting your money's worth, you're future-proofing for the next generation of video consumers, who overwhelmingly turn to YouTube—not just preferring it over TV, but over other online options—to watch the videos they love.